The Chief Justice of India J S Khehar had offered to mediate even as the bench headed by him suggested that the parties to the dispute adopt a "give a bit and take a bit" approach. The Supreme Court suggested resolving the contentious issue of Ram temple through talks, saying that it should be settled amicably. The apex court said that it is ready to mediate, if necessary. The Chief Justice of India J S Khehar had offered to mediate even as the bench headed by him suggested that the parties to the dispute adopt a "give a bit and take a bit" approach for a meaningful and sincere negotiations to resolve the vexatious issue. 1853: The year saw first religious violence at the site. 1855: A dispute over the possession of the mosque between Hindus and Muslims started. It is said that Sita Rasoi and Ram Chabootara was constructed around this time. 1859: British Colonial administration constructed railings to split the places of worship, allowing the inner area for Muslims and outer for Hindus. This was practised for 90 years. 1949: Lord Rama’s idol surprisingly appears inside mosque. 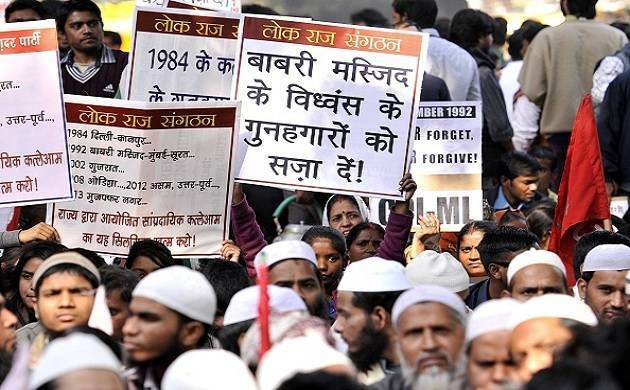 Hindus claim it to be a miracle while Muslims protest against it, resulting in both filing civil suits. Later, the government declares the area a heated one and shuts the gate. 1950: A suit is file in Faizabad by Mahant Paramhand Ramchandra Das and Gopal Singh Visharad to seek permission for offering prayers in Asthan Janmabhoomi. Though the gates are shut performing puja is allowed. 1961: Uttar Pradesh Sunni Central Waqf Board claims the mosque and the surrounding area is a graveyard and files a case. 1984: A committee is formed spearheaded by Vishwa Hindu Parishad party (VHP) under the leadership of Bharatiya Janata Party leader Lal Krishna Advani. The aim of the committee was to set free the birth-place of Lord Rama by constructing a temple in honour of the lord. 1986: After almost five decades, a district judge orders to open the gate and allow Hindus to worship inside the mosque which was once announced as the disputed structure. In less than 60 minutes of the court’s order the gates are opened. In protest of the order, Babri Mosque Action Committee is formed. 1989: Vishwa Hindu Parishad starts a campaign and lays foundation stone to construct a Rama’s temple on the area next to the ‘disputed area’. Former Vishwa Hindu Parishad’s vice-president Justice Deoki Nandan Agarwal, files a case asking to shift the mosque elsewhere. 1990: The mosque is partially damage by the volunteers of Vishwa Hindu Parishad. The then Prime Minister Chandra Shekhar tries to settle the issue through negotiations but gets no success. 1991: BJP comes in power in Uttar Pradesh. The power of the centre is Congress.